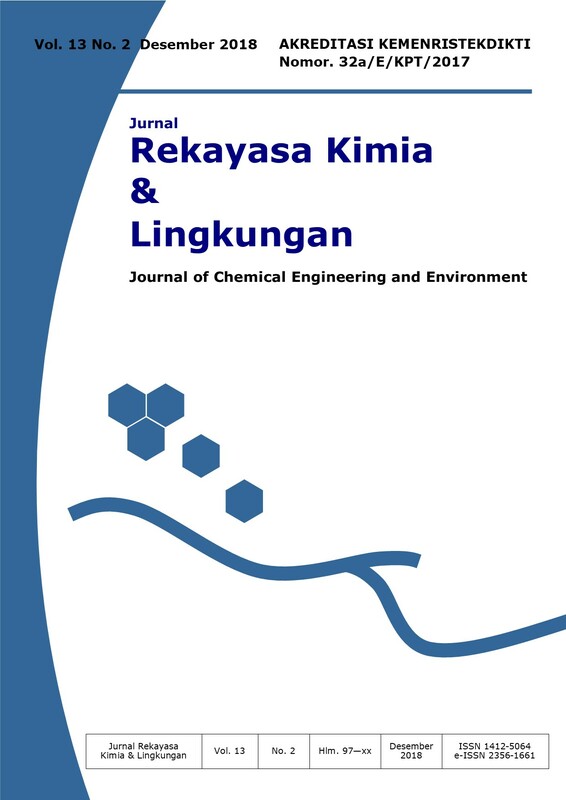 Journal of Chemical Engineering and Environment (Journal of Rekayasa Kimia dan Lingkungan) is published by Chemical Engineering Department, Faculty of Engineering, Syiah Kuala University. Journal of RKL is published two times annually (June and December). JRKL is published in printed version (ISSN. 1412-5064) and online version (e-ISSN. 2356-1661). JRKL journalâ€™s first publication of the printed version was in 2004. Whereas articles published in JRKL could be freely available online starting in 2006. JRKL provides open access following peer-review process. JRKL is indexed in Indonesian Publication Index (IPI) and Google Scholar. Jurnal Rekayasa Kimia dan Lingkungan (Journal of chemical engineering and environment)Â is accredited by Ministry of Research, Technology, and Higher Education of Indonesia, Number: 32a/E/KPT/2017, Started from April 27, 2017. Submitted manuscripts should be original Research Articles and Literature Reviews that aims for contribution and continuous dissemination of updates in relation to chemical engineering and environmental engineering sciences. JRKL editors welcome manuscripts in the form of research articles, literature review, or case reports that have not been accepted for publication or even published in other scientific journals.